Owls and birds and girly things in my baby girl's nursery, Oh MY! 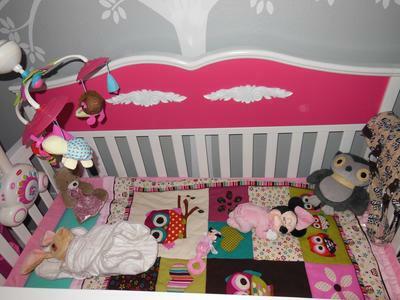 The patchwork baby crib quilt with owl theme appliques on the blocks and the mobile. Here are some pictures of our pink and grey baby girl's nursery that we decorated with owls, birds and girly stuff. Everything featured in the above pictures were not random purchases; each item was carefully chosen. I picked up most of my decorating ideas from Pinterest boards as well as other resources. See more ideas for a pink and grey baby girl's nursery decorated with owls, birds and girly stuff. I combined the ideas that I got from many different sources to create a unique design that I felt would serve well during my daughter's first years and beyond. I loved the idea of brightening the subtle, two-toned gray walls with bright colors, especially with shades of pink and teal. I got the owl themed handmade crib blanket and a lot of the owl and bird decorations, the pink flower hanging on wall and accent pillows from a variety of stores. I found them at Hobby Lobby, Big Lots, TJmaxx, Kirklands, Ross and Target. The tree wall decal that I found on Etsy and displayed behind the baby's crib is a natural continuation of the bird and baby owl nursery and serves as the main focal point in the room. 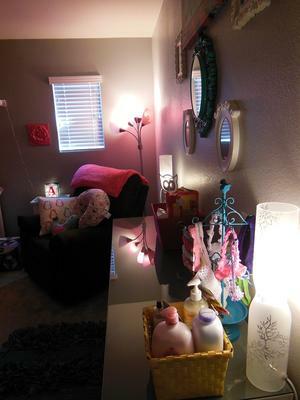 The pink lamp with five shades behind the comfortable chair that will be our reading light featured in my sweet girl's nursery pictures defines one of my favorite spots in the room. The big owl picture, all of the picture frames, tree etched lamps and the baby's dresser came from Ikea and the area rug and hamper came from Target. The small white table, the crib, and the mobile were all ordered from Amazon and the baby monitor was from Groupon. 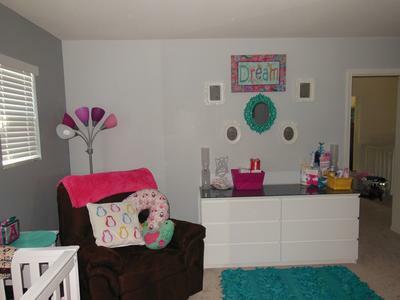 As you can see from the pictures of this space; it's a comfortable, colorful room with many points of interest to attract a little one's attention with lots of storage and style! I hope that you have enjoyed the tour of our baby's nursery and that you will pay it forward by sharing your own on Unique Baby Gear Ideas! 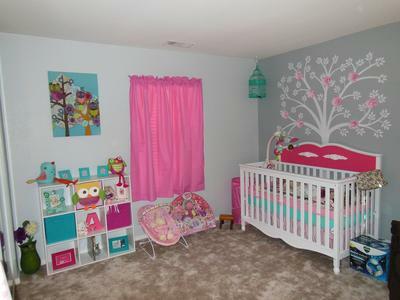 Where did you find the hot pink and white crib or did you add the pink paint yourself?